Chicken Fried Potatoes. These are glorious. Crispy on the outside thin potato slices and a French fry in the middle. So that’s pretty awesome right? We also made a homemade buttermilk ranch dipping sauce. This is one of my favorite appetizers we have posted recently because it’s really simple to make, not a whole lot of ingredients, and its totally delicious. 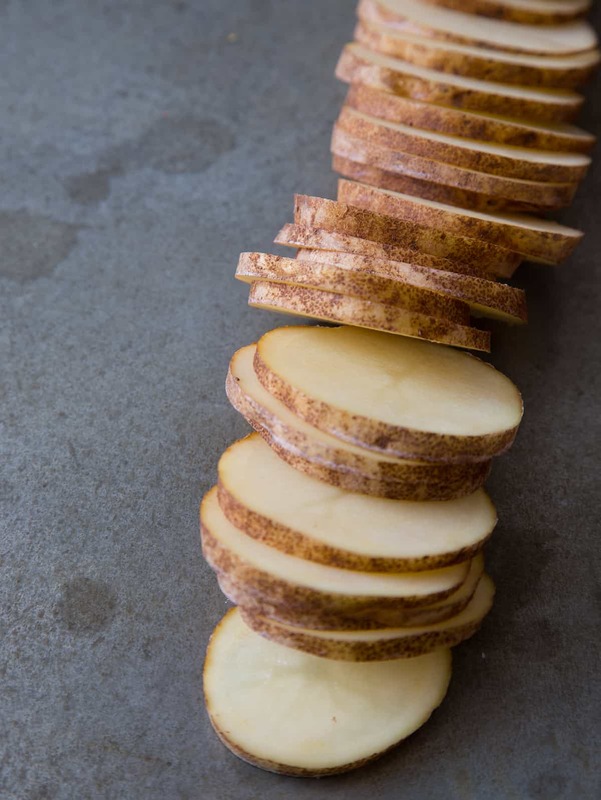 Once you have your assembly line down for the coating of the potato slices everything else is a cinch. It’s really easy to make batches and batches of these. You all know these would be perfect for Super Bowl, but I think these would be perfect for lots of situations, like as a side dish to our 50/50 burger, or just as a meal on it’s own (cause you’re an adult and you can do what you want), or as a delicious snack. Lot’s and lots of ways for this recipe to be enjoyed, so get to it! 1. Fill a large, deep skillet with 1 1/2 to 2 inches of oil and preheat to 350˚F. 2. Place potatoes, buttermilk, thyme, garlic, 1/2 teaspoon salt, and 1/2 teaspoon cracked black pepper into a mixing bowl and toss together until well combined. Allow mixture to sit for 15 minutes. 3. Place flour, onion powder, mustard, paprika, 1 teaspoon salt, and pepper into a shallow dish and stir together. 4. 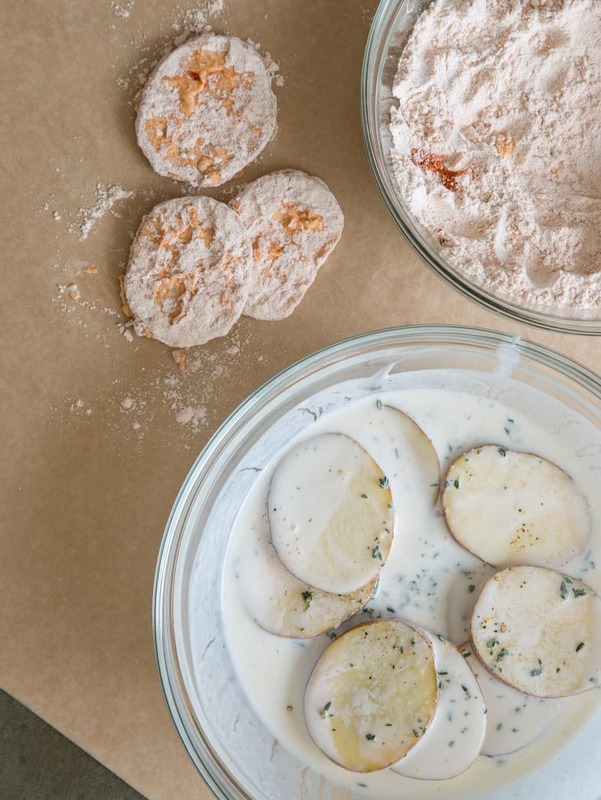 Remove potatoes from buttermilk and dredge in flour mixture. Shake of excess flour and fry potatoes in batches for 6 to 8 minutes or until golden brown and potatoes have cooked through. Drain onto a paper towel and season with salt and pepper. 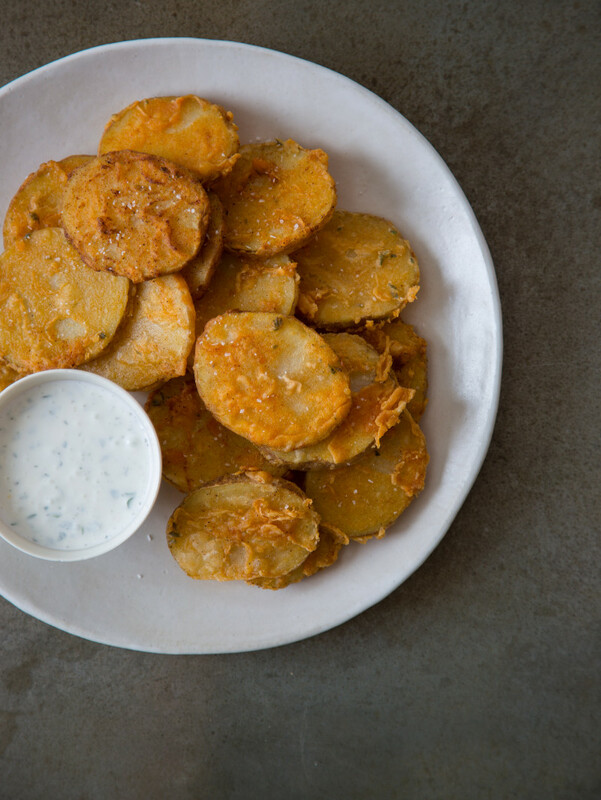 Serve with buttermilk dipping sauce. 5. For buttermilk sauce: Place all ingredients into a mixing bowl and whisk together until well combined. Cover and refrigerate for at least 1 hour. Before serving remove from refrigerator and allow to sit at room temp. for about 10 minutes. Adjust seasonings and stir. For a second there, when I read the title of he recipe, I thought the spuds were actually fried in chicken skin. Now that thought won’t leave my mind. It has to happen. Thanks for the inspiration guys, I would eat a con-so-de-rab-le amount of these right now! Hello, Super Bowl finger foods! Much better than buying pre-made crap, and undoubtedly tastier, too! “….’cause you’re an adult, and you can do what you want!” Classic! I hate-love you guys for recipes like this! Oh my goodness, this has to happen. the recipe looks great but why the name? I kept looking thru the recipe to find chicken mentioned. Can you substitute butter milk for anything else? This sounds freaking ridiculous. In the best possible way. Oh my gosh, I bet this is just incredible! You had me at Chicken Fried. Looks incredible. Ooh yum! 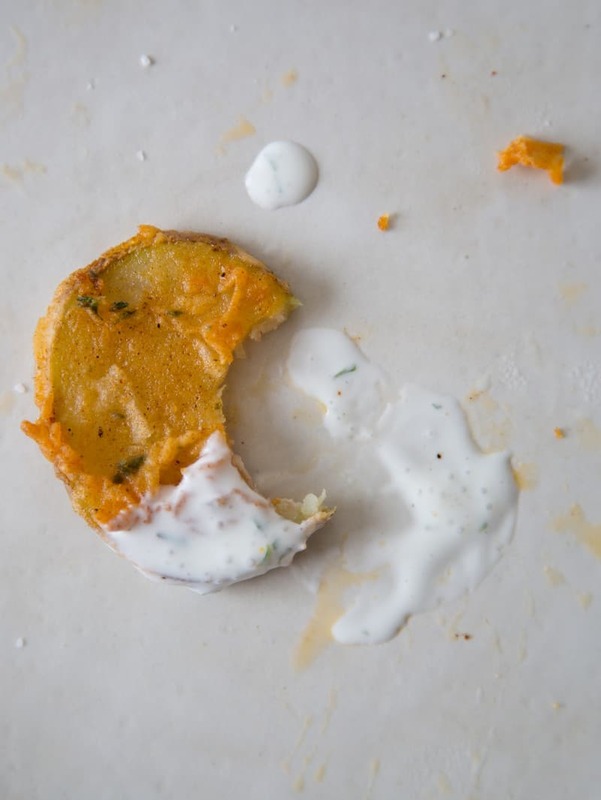 Fried potatoes with homemade ranch? I can probably devour a bowl of these. Oouuuu I can’t wait I’m making this tonight definitely. with fried chicken ofcourse.